It was late December, 1967, and the Cleveland Browns had just been eliminated from the NFL playoffs in the conference championship game. Their season was officially over, but not exactly . . . in two weeks, as the league mandated at the time, they had to play one more game, an exhibition in Miami. The players had about week off before the team started practicing again. That’s when Fred Hoaglin and Ernie Kellerman got an idea. Hoaglin and Kellerman, the team’s center and strong safety, had been golfing buddies all season. They played on their Monday off days and on some Tuesdays, too, over at the Mayfield Country Club. With so much time off now, they figured they could sneak down to Florida early and play some golf. They asked a friend, the golf pro over at Mayfield, to set them up at a course, and he arranged for them to play at the famous Doral Country Club. In exchange, Hoaglin and Kellerman had to drive the golf pro’s Cadillac down to Florida, so he’d have it there when he migrated south for the winter. Hoaglin and Kellerman made the drive—more than 1,200 miles in all—and when they finally arrived at Doral, they were told that someone was waiting for them. The person had heard that two football players were coming and wanted to play with them. They went over to the first tee and there he was: Rocky Marciano. At first, Kellerman didn’t recognize him. “You’re in movies, aren’t ya?” he said. Hoaglin was incredulous. “Ernie, that’s Rocky Marciano! He’s the undefeated heavyweight of the world!” This was decades before the internet, before the rise of sports TV, and Marciano had been retired for about 11 years. Rocky laughed. 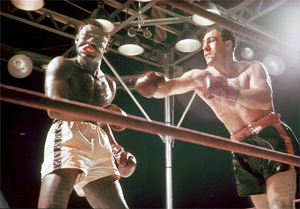 Rocky Marciano (r.) in a heavyweight title bout against Ezzard Charles at Yankee Stadium in 1954. They played a round together, and now, 50 years later, Hoaglin still remembers several details about that day. He remembers Marciano’s thick Massachusetts accent. He remembers what Marciano was wearing: a navy blue BanLon shirt and Bermuda Madras shorts. He remembers Marciano almost getting a hole-in-one on the 16th green: “It bounced about eight inches away from the hole.” He remembers them asking, Hey, Rock, who hits the hardest? 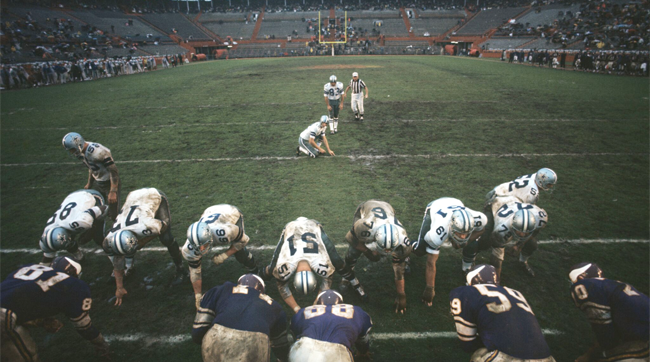 Before a mostly empty stadium at the Orange Bowl, the Cowboys’ Mike Clark kicks a field goal during the Playoff Bowl against the Vikings in 1969. The NFL started this exhibition game in 1960, just as the rival American Football League was taking shape. The idea was that after the NFL crowned its champion, the league would stage an extra game between the two teams that finished second in each conference—a third-place game, essentially. From 1967, when the league split the conferences into two divisions each—Capitol and Century in the East, Coastal and Central in the West—and introduced the conference championship games, the third-place game would pit the conference title game losers against each other. This gave the NFL another game to put on TV and another way to generate revenue—and, the league said, at least some of that revenue would go to benefit a retired players’ pension fund, at a time when the league did very little to care for its players. At first, the NFL called it the Bert Bell Benefit Bowl, after the commissioner who died of a heart attack in 1959. Then it became known as the Playoff Bowl and also the Runner-Up Bowl. Players and coaches had their own names for it: Losers’ Bowl, Toilet Bowl. Vince Lombardi famously called it “a hinky-dink game.” Neither the game’s stats nor the result would count, so the players and coaches always asked, What’s the point? There was one silver lining, though. The game was played in Miami, at the Orange Bowl, and this was before the creation of the Miami Dolphins and the AFL-NFL merger, so most of the players had never been there before. “It was like a vacation for us,” says Roman Gabriel, the quarterback of the L.A. Rams, who played in two Playoff Bowls, in 1968 and ’70. Some coaches even embraced the casualness, too. George Allen, the Rams’ head coach from 1966 to ’70, was notorious for his tough practices. He would tell players, according to Gabriel’s recollection, that “to be able to win, you have to be able to withstand pain and agony.” But when they played in the Playoff Bowl, Allen eased up a bit. The Rams didn’t wear pads (only helmets) during practice before the exhibition game and he pushed curfew back from 11 p.m. to 1 a.m., which was risky, because the Rams stayed at the Fontainebleau hotel, a legendary nightspot on Miami Beach. The Rams, for the most part, complied. They stayed and drank at the hotel bar and still pushed their curfew. It reached the point, in 1970, where the hotel bartender remarked that he was betting on the Cowboys, the Rams opponent, because he’d seen the Rams at his bar getting drunk all week. The Rams won in spite of him, 31-0. There was, of course, plenty to do outside the hotel. When the Browns played the Packers, in 1964, several African-American players gathered at the Sir John’s club, a famous hotspot in the Overtown district of Miami. At the time, the city was segregated. The African-American players on the Browns wouldn’t have been able stay at the same hotel as their teammates, had the team had not stood firm and pressured the hotel into relenting. The Sir John’s club was their sanctuary. Every day after practice, Jim Brown, the Browns’ star running back, and black players from both teams would mingle there. And, every day, who else would invariably show up? Cassius Clay and his entourage. Clay was in Miami training to fight Sonny Liston for their 1964 heavyweight title bout, the first of their two meetings. 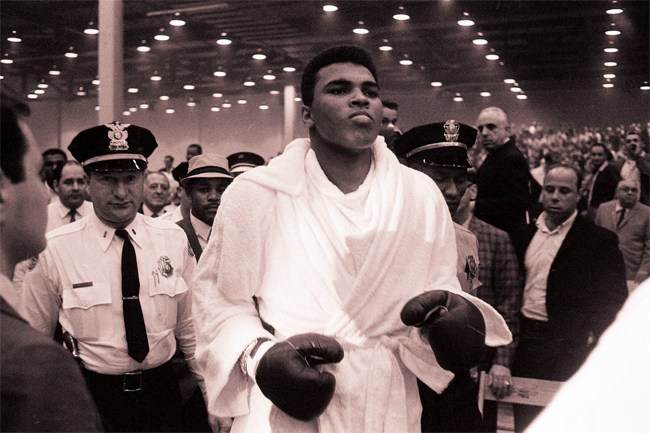 Cassius Clay walks to the ring for his February 1964 heavyweight title fight against Sonny Liston in Miami. These happenstance meetings turned out to have some historical importance. About three years later—after Clay beat Liston for the heavyweight title, after he changed his name to Muhammad Ali, and after he became a conscientious objector of the Vietnam War—Ali traveled to Cleveland to meet with Jim Brown and several other socially conscious athletes to discuss his stance on the war. The meeting is remembered as The Ali Summit. At the end of the meeting, Brown and the other athletes—a group that included Bill Russell and Kareem Abdul-Jabbar—held a press conference saying they were backing Ali. “Because of that relationship with Ali [going back to the Sir John’s club in Miami], we supported him,” says John Wooten, a Browns offensive lineman who was a regular at the club and also attended the summit. If the Browns weren’t out at Sir John’s, they were out experiencing the rest of Miami. Many players had brought their wives with them. 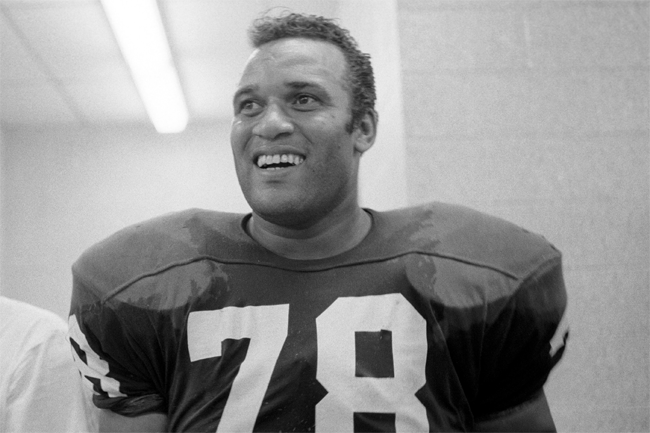 Fred Hoaglin, the Browns’ center, recalled how, one night in 1968, the whole offensive line went out to dinner with their significant others and lucked into seeing Diana Ross and the Supremes perform. But there was one catch. If a player brought his wife down, he usually had to pay for the expenses himself, and the players weren’t making much money off this game. If they won, they’d receive a bonus—a few hundred dollars, at best, says Joe Horrigan, the executive director of the Pro Football Hall of Fame. And if the players lost, they would receive even less. After the week of partying ended and the Playoff Bowl finally arrived, the players said their pride took over and they gave it their all. Whether that’s true or not is debatable. Of the 10 Playoff Bowls that the NFL staged, five were close games and five were blowouts—with an average margin of victory of 26.4 points per game. Perhaps no one took the Playoff Bowl more seriously than Roger Brown, a 300-pound defensive tackle who played in five of the 10 Playoff Bowls. He played in the first three, as a member of the Detroit Lions, and in two more as a Ram, under coach George Allen, in 1968 and ’70. In 1968, the Rams were playing the Browns, which meant that, after playing golf with Rocky Marciano and seeing Diana Ross perform, Fred Hoaglin had the task of blocking Roger Brown. Hoaglin saw up close how intense Brown played. At the time, Brown was famous for using a move called the Head Slap, which is exactly as violent as it sounds. As the ball was snapped, he would slap the offensive lineman in the head, leave him stunned, and run around him before he regained his bearings. Fortunately for Hoaglin, Brown spent much of that game lined up across from the left guard, John Wooten, the Ali Summit attendee who frequented the Sir John’s club. At one point during the game, Hoaglin looked at Wooten in the huddle and noticed that he was bleeding from his left ear. Wooten explained that he had been trying to block Roger Brown’s Head Slap by putting up his hand to protect himself—and Brown had just been slapping Wooten’s hand into his own head. “I think I broke my thumb!” Wooten said. Roger Brown and the Rams won that game, 30-6, thus cementing his legacy in Playoff Bowl lore. Those five Playoff Bowls that Brown played in? His team won every one. The 1970 Playoff Bowl, a 31-0 win over the Cowboys, happened to be the last Playoff Bowl ever played—and the last game of Roger Brown’s career. He retired after 10 seasons, having never played in the championship game.